The 2018 Honda Clarity has just arrived and it is already remodeling the plug-in hybrid market by setting the benchmark in terms of style, technology and comfort. This premium sedan incorporates a revolutionary style outside, comfort inside and state of the art technology under the hood. It is offered in base and Touring models, both of which come with an extensive list of standard features that will please any type of driver. On the road, the 2018 Honda Clarity alternates between three drive operations: EV Drive, Hybrid Drive and Engine Drive, utilizing power from the Atkinson-cycle i-VTEC 4-cylinder engine, an electric motor and a 17-kilowatt hour (kWh) battery pack to offer a perfect balance between efficiency and power. These mechanical components are controlled by the Power Control Unit (PCU) that finds the ideal combinations between these elements. Thanks to this power plant and advanced electronics behind it, the 2018 Honda Clarity can offer a combined fuel consumption of as low as 2.1 Le/100 km. Total charge time is 2.5 hours when using a 240 volt outlet. 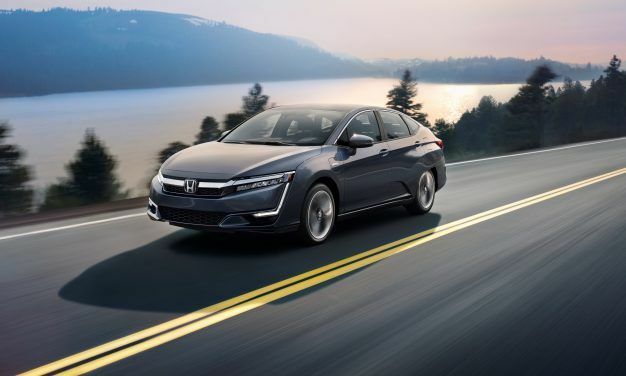 Outside, the 2018 Honda Clarity incorporates distinctive styling elements, but these are not only there to put the Clarity ahead of its rivals in terms of design; they also contribute to the overall fuel efficiency of this premium sedan. Exterior elements include advanced aerodynamic treatments, full LED lighting, high-efficiency Smart Clear Wipers (windshield wipers), a distinctive front-end styling dominated by LED DRLs, LED headlamps and the Honda grille. The body is designed slip through the wind with minimal aerodynamic disturbance thanks to front air curtains, rear tire covers and rear air curtains. Inside, the 2018 Honda Clarity offers comfortable seating for up to five passengers. The interior is environmentally responsible and was developed to reduce carbon emissions by adopting plant-derived green and recycled materials. All plant-based materials are made of oils extracted from non-edible parts of plants. But that doesn’t mean the Clarity Plug-in Hybrid is lacking technology; in fact, it features more technology than its rivals. Elements like an 8-inch Display Audio touchscreen, Android Auto and Apple CarPlay integration, rearview camera with dynamic guidelines, 7-inch TFT intelligent Multi-Information Display (i-MID) within the instrument cluster, 180-watt 8-speaker audio system and dual-zone climate control are all part of the list of available equipment on the 2018 Honda Clarity Plug-In Hybrid. The Clarity Plug-In Hybrid combines Honda's "fun to drive" philosophy with a refined driving experience and great fuel economy. 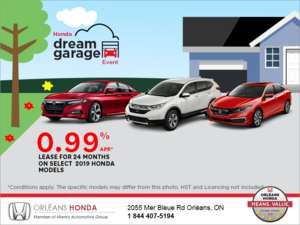 Come and see it today at Orleans Honda.